We ed Fisht mountain after long disputs. The route was to go along the Western face. 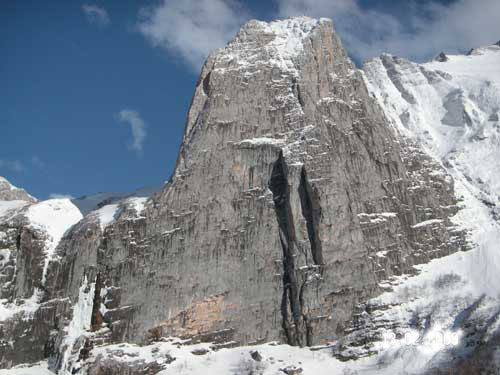 The face height is 560 m . Fisht mountain was the peak in the western part of the Main ridge of Caucasus, altitude 2867 m . It is situated in Krasnodar region (Apsheron region and region of Large Sochi). Translated from Adygei it means “White head”. This is the most western icy peak of The Caucasus . Fisht mountain is a stone raising, made by layers of the reef lime stones, but on its southern and south-western slopes there are also crystalline rocks. It is considered that the mountain was an island in the ancient Tetis ocean, and this is an explanation of its coral construction. On the slopes of the Fisht mountain rivers Psheha and Belaya begin, that fall into Kyban, and Shahe, falling into the Black Sea . "Today at 10-25 the team of Rostov region with its full complement — Spiridonov Alexander, Petyakshev Vasiliy, Podlesny Dmitriy, Dmitrienko Eugene, Bolkovoy Eugene — ascended the summit of Fisht mountain by the center of the Western face . The weather became worse since yesterday— low visibility, strong wind. Descent along the ascent way." Continuing bad weather increased the snow height and difficulties began already between the camp and the face. Yesterday party of two Podlesny-Petyakshev was ascending to the route breast deep in fresh snow for 2,5 hours instead of 15-20 minutes. That day 1,5 pitch was done. Today the weather improved, but forecasts promise snowfall today afternoon. Frost became stronger. Today Spiridonov and Dmitrienko work on the face. Tomorrow guys are going to ascend on the summit у if everything is all right. If time won't be enough —there already is a portaledge on the face. Descent is planned along the ascent way. Today at 12-00 6 pitches have been done. Weather doesn't improve — it is snowy, low visibility. The forecasts don't promise any improvement, so the guys continue working in any weather. Today party of two Podlesny-Petyashkin are working on the face. 2 parties of two work on the route: Spiridonov-Dmitrienko, Podlesny-Petyashkin. Because of the weather they can pass no more than pitch a day. Today 3 pitches are passed. Today Spiridonov-Dmitrienko are working on the face. Weather isn't changing. Cars didn't drive 20 kilometers till the planned BC because of snowfalls. Snowmobiles were used. Now the camp is installed. Processing of the route began, 2 pitches are done. Weather is bad – it is snowy, visibility is 50 m .
On February 27 at 23-00 the combined team of Rostov region started taking part in XXVII Championship of Russia, in first ascent class.